San Francisco has four distinct seasons. Some people think that San Francisco’s climate is similar to the sunny year-round climate in Los Angeles, but that is not the case. 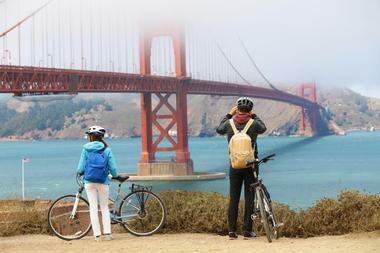 There are many crowds during the summer partly because of summer breaks, and partly because of the popularity of San Francisco as a tourist destination. But if visitors are looking for sunny days at the beach, they will most likely be disappointed - when the fog rolls in from the Pacific Ocean, it can be very chilly in the summer. Winter is even colder but hotel rates are low. 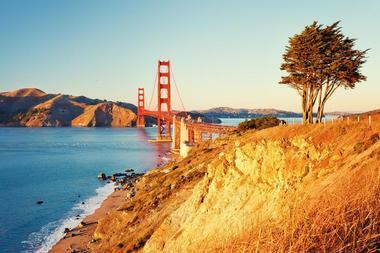 Autumn and spring are the best times to visit San Francisco - there are fewer crowds and warm temperatures. In January, San Francisco gets approximately 165 hours of sunlight, which makes days feel relatively shorter. It’s also one of the coldest months of the year (tying with December) with an average high temperature of 57F (14°C) and an average low temperature of 46°F (8°C). February sees a small increase in the average high temperature as it rises to 60°F (16°C). The average low temperature, on the other hand, rises a single degree to 47°F (9°C). In March, temperatures continue to rise as spring arrives in San Francisco. The average high and average low temperatures measure at 62°F (17°C) and 49°F (9°C) respectively. San Francisco Weather in April: Average high temperatures increase by another degree in April to 63°F (17°C). Meanwhile, the average low temperature remains the same. May sees sunnier days as spring nears its end. San Francisco gets 314 hours of sunlight. Meanwhile, average temperatures continue to increase with the average high temperature increasing by another degree to 64°F (18°C), and the average low temperature getting bumped up by 2 degrees to 51°F (11°C). In June, San Francisco receives the most sunlight out of the year at 330 hours. The average high and average low temperatures increase by 2 degrees each to 66°F (19°C) and 53°F (12°C) respectively. July’s average sunlight decreases to 300 degrees while precipitation levels are at the lowest for the entire year with San Francisco expecting no rain. The average high temperature and the average low temperatures range between 67°F (19°C) and 54°F (12°C). San Francisco Weather in August: San Francisco’s summer months are enjoyably cool and temperate and August is no different. The average high temperature is a comfortable 68°F (20°C) while the average low temperature reaches 55°F (13°C). September is the hottest month of the year as average high temperatures reach 70°F (21°C). The average low temperature remains the same at 55°F (13°C). In October, the temperature decreases by one degree for both the average high and average low temperatures. November’s temperatures take a steep decline with the average high and average low temperatures ranging between 63°F (17°C) and 50°F (10°C). It’s the last month of San Francisco’s fall season and the perfect time to visit California’s theme parks. December ties with January as the coldest month of the year with an average high temperature of 57°F (14°C), and an average low temperature of 46°F (8°C). The cold temperatures are matched by the least amount of sunshine in year, 156 hours, and the highest precipitation rate annually at 5 inches (116 mm). California is known for many things, one of which is its gorgeous redwood forest. The best time to visit the redwoods is in the summer month, but if you prefer peace and quiet during your travels, come in March or April. When it comes to California’s theme parks like Legoland, Disneyland and Universal Studios, it’s best to come mid-September through mid-November. Experiencing California’s wineries is best done in between late August and October while the fall foliage is at its best from late September to November. For travelers who intend to spend their time at California’s gorgeous beaches, plan to come anytime between May and October. Amtrak runs a train from New York via Chicago to San Francisco. Arriving by car is easy: I-5 and U.S. 101 are the two major routes in and out of San Francisco. Five bus companies offer service into San Francisco including Greyhound, Megabus, and the Hoang Express. San Francisco’s Visitor Information Center (VIC) has been offering its services to visitors for more than 30 years. There are two locations in the city: the main center is the Visitor Information Center at Hallidie Plaza on Market Street; and the other location is the Visitor Information Center at Macy’s Union Square. Both of these centers are well located in areas that are easy for visitors to find. Professionally trained staff members help visitors find accommodations, restaurants, attractions, and shopping areas. They help visitors to navigate the city, offer suggestions, and help visitors plan their itineraries. The center sells CityPASS vouchers which means big savings on transportation and attractions. Many of San Francisco’s main attractions are within walking distance of each other, so these can easily be reached on foot. The city is compact and the streets are easy to navigate. To get to places that are farther away, public transportation is the best way to go. 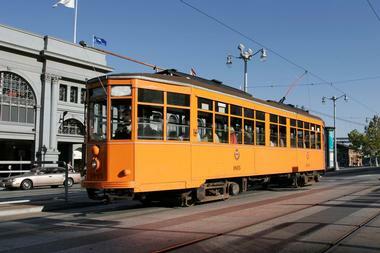 The San Francisco Municipal Transportation Agency runs its “Muni” system. 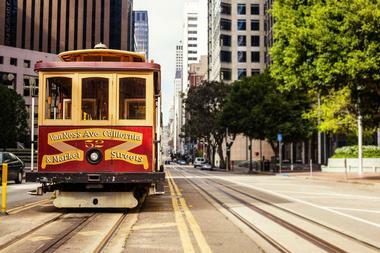 This system includes buses, streetcars, rail lines, and San Francisco’s world-famous cable cars. There are individual fares, but if plan to use the system a lot during your visit, it’s best to buy a Muni Passport. This offers unlimited rides for one, three, or seven days. Another option is the San Francisco CityPASS. 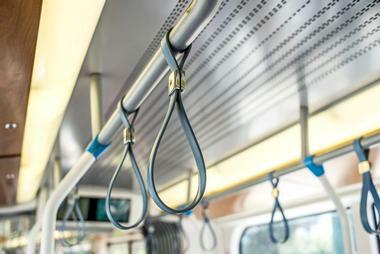 In addition to San Francisco’s Muni system, the Bay Area Rapid Transit (BART) is another way to get around the city and other places around the Bay area. Taxis are another option although they can be hard to find in the city, and they are an expensive way to get around. If your visit is centered around the top attractions within San Francisco, you don’t need a car: parking is expensive, traffic can be congested, and drivers are known for being aggressive. But you’ll need a car if you want to explore areas outside of the city. There are ferries that run from Fisherman’s Wharf and from the financial district in the city to several nearby towns. San Francisco’s restaurant culture was born during the 1849 Gold Rush when eateries were created to feed hungry immigrant miners food from their home countries. 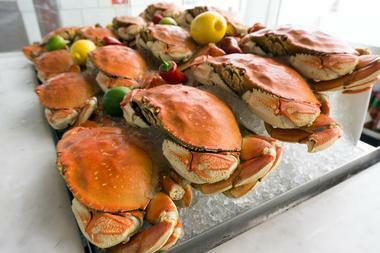 Dining in San Francisco can range from Michelin-starred fine dining establishments to inexpensive Chinese restaurants in San Francisco’s Chinatown. This Chinatown has the largest Chinese population outside of China. The city is blessed with year-round local organic produce, free-range meats, seafood, and excellent wine from nearby Napa Valley. Many restaurants are run by young chefs who show off their creative skills in this restaurant-obsessed city: there are more than 3,500 restaurants in San Francisco! San Francisco has many shopping areas in the city itself rather than big shopping malls in the suburbs. This is because the city is built on a peninsula with water on three sides: this prohibits expansion and the building of suburbs. San Francisco’s most popular shopping area is Union Square: here you’ll find big department stores and upscale specialty shops. Chinatown is known for its small shops selling art, herbs, jewelry and more. Jackson Square is the place to see 17th to 19th European furnishings. Although most of your shopping will be done in these shopping areas, there are a few shopping centers like Pier 39, Ghirardelli Square, and the Westfield San Francisco Centre. 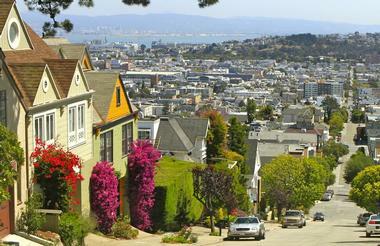 San Francisco is a very hilly city and this terrain has created its many neighborhoods. Nob Hill and Russian Hill are known for Grace Cathedral, the Fairmont San Francisco Hotel and other luxury hotels, and Lombard Street, “The Crookedest Street in the World.” The Embarcadero is the waterfront area with the Ferry Building Marketplace and great views of the Bay. North Beach has many Italian cafes and restaurants: its nickname is “Little Italy.” Fisherman’s Wharf is a very popular tourist area with its many seafood restaurants, souvenir shops, and sea lions. Pacific Heights is full of Victorian mansions, parks, and great views of the Golden Gate Bridge. 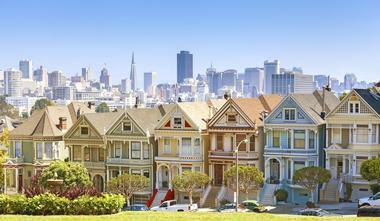 With its spectacular setting and views, San Francisco is a popular city for weddings. 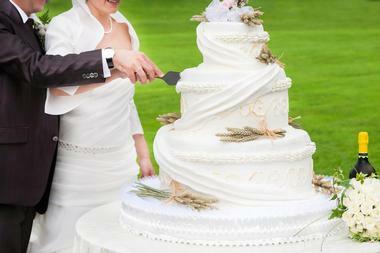 A marriage license can be obtained at the Office of the County Clerk in San Francisco’s City Hall. Hotels that make great venues for weddings include the Clift Hotel, the Sir Francis Drake Hotel, the Marine’s Memorial Club and Hotel Union Square, and Park Central Hotel SF. Since San Francisco is surrounded by water, getting married on the Bay appeals to some people: Hornblower Cruises and Events and Commodore Cruises and Events can each accommodate up to 300 guests. Some additional wedding venues in San Francisco include the City Club of San Francisco, the Swedish American Hall, the Julia Morgan Ballroom, and more. 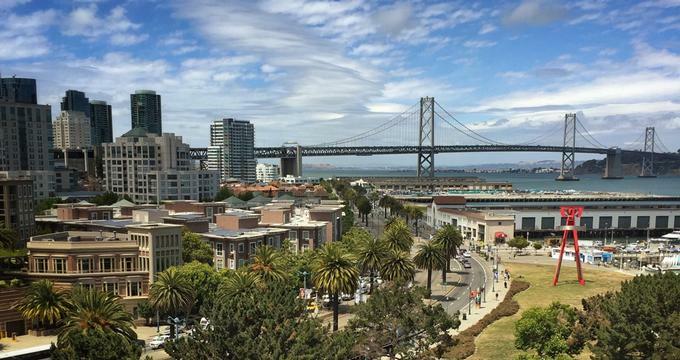 San Francisco hosts more than 15 million visitors per year, so it has many hotels from which to choose, from luxury hotels to budget hotels and quaint bed and breakfasts and inns. 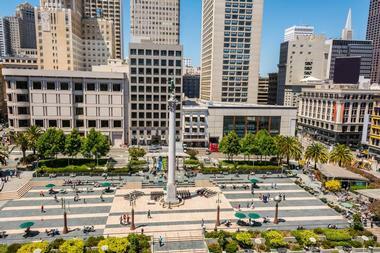 Most of the city’s hotels are clustered around Union Square. Stay here if you want to be in the center of the tourist action; or, choose accommodations in one of the city’s residential areas and enjoy a local experience. 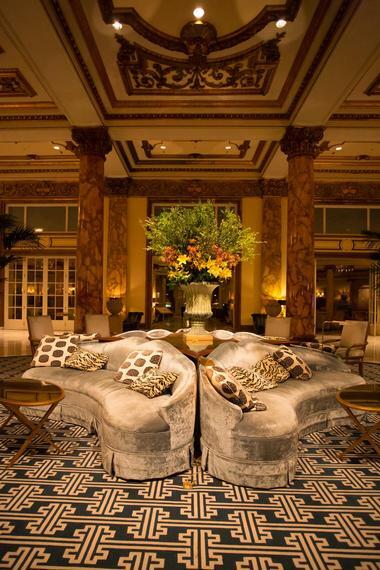 Luxury hotels include the St. Regis San Francisco, the Ritz-Carlton, the Four Seasons Hotel San Francisco, the Fairmont San Francisco, and more. Budget hotel chains include Days Inn and Travelodge. Bed and breakfasts offer just a room or a whole house.